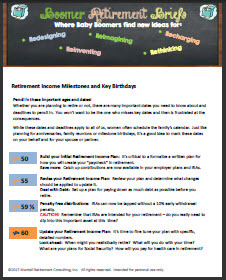 Home » For Women, Retirement Resources	» Do You Know Your Retirement Income Milestones And Key Birthdays? Download your copy of Milestones and Key Birthdates. Mark your calendar so you don’t miss a critical retirement planning date. Birthdays are full of favorite people, presents and treats. Everything from balloons and streamers to ice cream cake with the chocolate crunchies in the middle. So, it can come as a shock upon reaching the glorious age of 50 that birthdays now take on a whole new meaning. They are now important dates that include milestones for getting ready for and living in retirement. 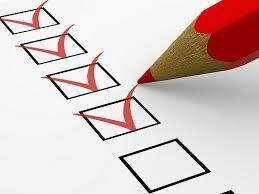 So, do you know all of your most important retirement income milestones and key birth dates? Some are imposed by the IRS. Some come about from your employer’s retirement savings plan. And, others are tied to the entitlement programs of Social Security and Medicare. You might reach a milestone this year, or not until 2028. The most important thing is to know your own dates and get them on your radar. To make things easier, you can download the attached 2-page PDF to get a full list of those important dates that will impact your retirement. From the earliest date – your 50th birthday – all the way to age 70 and ½ when you must take required minimum distributions, you’ll get a good look at those dates that matter. Grab a pencil, get out your markers, or update your smart phone calendar. Note these important ages and dates for you, or for you and your spouse or partner. Whether you are planning to retire or not, there are many important dates you need to know about and pencil in. You won’t want to be the one who misses key dates and then is frustrated at the consequences for missing deadlines!